Submitted photo Soin Medical Center offers a residency program for the area’s future doctors. This year’s residents include: Front Row - Dr. Farhan Rafi, Dr. Courtney Stroble, Dr. Steven Tomlinson, Dr. Hannie Tran, Dr. Claire Nelson, Dr. Jerika Ortlieb, Dr. Anna Squibb and Dr. Joshua Slusher. Back row - Dr. Jonathan Stofer, Dr. Justin Tuot, Dr. Michael Villasin, Dr. James Tytko, Dr. Christopher Holloway, Dr. Michael Nwosu and Dr. Isaac Koh. Not pictured is Dr. Jonathan Gaskill. BEAVERCREEK — Soin Medical Center offers future doctors hands-on training in the hospitals residency program run by Dr. James Tytko and Dr. Anna Squibb. Doctors Squibb and Tytko both believe a family medicine residency program is key to a hospital. The doctors agree that by training with physicians of all specialties at Soin Medical Center, the future doctors will be building relationships that will continue when they have their own practices in the community. “During training, every resident physician is taught by more than 90 physicians in Kettering Health Network. We are grateful for the support of the network and the physicians training our residents. From a hospital perspective, having resident physicians improves quality, morale and continues to bring an academic perspective to medicine,” added Dr. Tytko. When Soin Medical Center was opened in 2012, it was the vision of the administration and graduate medical education for a primary care residency to be the anchor program at the hospital. “We began in 2016 by partnering with the well-established medical education program at Kettering Medical Center to develop our plan and application for a new residency,” said Squibb. In January 2017 the hospital was approved for a six per-year program and was able to successfully recruit top notch physicians to work in the program. In its second year, there are six physicians working at Soin. Both doctors wish to see that number grow to 12 in 2019 in anticipation of a primary care shortage in the nation. The program is designed to train future doctors with full spectrum of experience. And Soins resident physicians are getting experience in all forms of care. “We provide outpatient care from birth until end of life, including care in collaboration with Trinity nursing home. We provide hospital based care for newborns, adults and maternity services at Soin Medical Center. We have sports medicine services, top notch pediatric care, prenatal and delivery care, and of course outpatient primary care. We provide care and train physicians to meet all of our patients needs at any point in their life, whether that is at our office or in collaboration with the specialists in the region,” added Tytko. Submitted photo Soin Medical Center offers a residency program for the area’s future doctors. This year’s residents include: Front Row – Dr. Farhan Rafi, Dr. Courtney Stroble, Dr. Steven Tomlinson, Dr. Hannie Tran, Dr. Claire Nelson, Dr. Jerika Ortlieb, Dr. Anna Squibb and Dr. Joshua Slusher. Back row – Dr. Jonathan Stofer, Dr. Justin Tuot, Dr. Michael Villasin, Dr. James Tytko, Dr. Christopher Holloway, Dr. Michael Nwosu and Dr. Isaac Koh. Not pictured is Dr. Jonathan Gaskill. 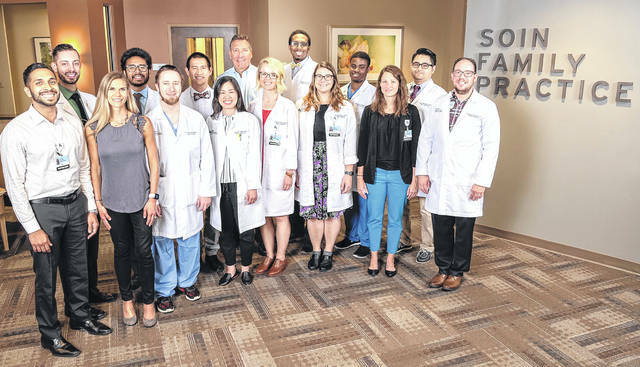 https://www.beavercreeknewscurrent.com/wp-content/uploads/sites/49/2019/01/web1_SoinResidents.jpgSubmitted photo Soin Medical Center offers a residency program for the area’s future doctors. This year’s residents include: Front Row – Dr. Farhan Rafi, Dr. Courtney Stroble, Dr. Steven Tomlinson, Dr. Hannie Tran, Dr. Claire Nelson, Dr. Jerika Ortlieb, Dr. Anna Squibb and Dr. Joshua Slusher. Back row – Dr. Jonathan Stofer, Dr. Justin Tuot, Dr. Michael Villasin, Dr. James Tytko, Dr. Christopher Holloway, Dr. Michael Nwosu and Dr. Isaac Koh. Not pictured is Dr. Jonathan Gaskill.